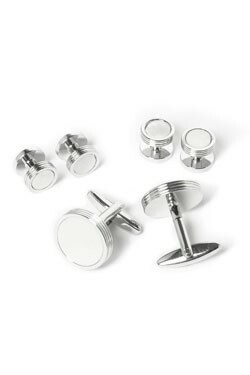 Essential for anyone who owns a tuxedo, these classic cufflinks and studs can be worn as a set or separately for a modern and impactful look. While cummerbunds are thankfully a thing of the past, traditional tuxedo accessories can have a place in a modern look. We love the added touch of these classic tuxedo cufflinks and studs. Wear these black and chrome studs with a pleated-front tuxedo shirt for the most impact. Or just wear the cufflinks alone for a complementary detail.